Lancaster County Courthouse has a new employee—and this one walks on four paws. 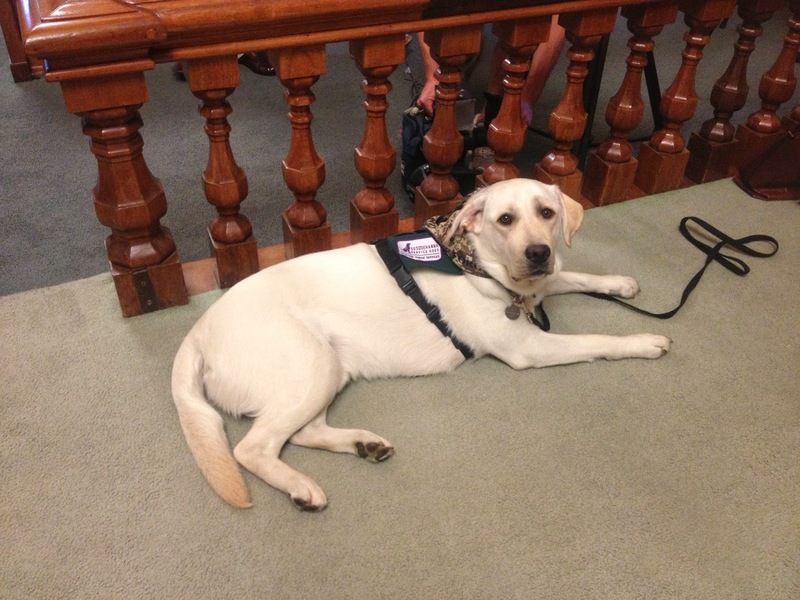 SSD Hamlet has started working at the courthouse as a facility dog. He’ll be working with participants in the Veterans, Mental Health, and Drug Treatment Courts, and he’s only the second dog in the United States to work in the treatment courts. SSD Buster of York County was the first. Hamlet’s job is to help reduce the stress and anxiety of participants going through the treatment courts. Unlike other working dogs, his harness does not include a “Don’t Pet Me, I’m Working” patch because part of his job includes being petted by individuals going through the court system. Research has shown that petting a dog and interacting with a dog can raise the levels of oxytocin in a person, which in turn helps decrease anxiety and stress. Having Hamlet there will help people see the court as a place of support, where they can find the resources they need so they can graduate from the program. When they see it as a positive place, they’re more likely to come to court for help. Hamlet will be working in the courtroom once a week. The rest of the time, he will sit in on appointments with probation officers, offering his special form of canine support. He has been trained to do several tasks, including “visit” (resting his head in someone’s hand or lap), “lap” (putting his front legs on someone’s lap), and “place” (sitting between someone’s legs). And Hamlet sometimes adds a few doggy kisses when he’s performing a cue. Hamlet was officially introduced in court on June 26, and he’s already gaining a reputation as a source of support. After his court appearance, many people stopped by to pet him for a few moments. In fact, Hamlet’s presence at the courthouse is affecting more than just the participants in the treatment court. He is also helping to reduce the stress of court employees. A few moments with Hamlet after a stressful phone call or meeting can make all the difference. When he’s not working at the courthouse, Hamlet lives with Karen Andreadis, the Treatment Court Coordinator for Lancaster County Adult Probation and Parole. He gets plenty of time to relax and just be a dog. We hear that he loves playing with Karen’s other dogs and taking his toys out to his favorite tree. In case you missed it on June 26, here’s the news story about Hamlet’s official introduction in court. Since Monday, five people have been learning how to work with their new service dogs. We’re in the midst of Team Training, a time when individuals receive their service dogs, learn all the cues and behaviors, and learn how to work in public as a team. This is a challenging, but amazing, two and a half weeks. You can see more photos from the week on our Facebook Page. A lot of hard work and love goes into the training of each service dog, including over 20,000 volunteer hours. There’s a lot that goes on behind the scenes to make Team Training possible. Our new director Pam Foreman’s presentation from this year’s graduation gives a glimpse of the people who make Team Training and all of SSD possible. You’ll also learn a little more about Pam and the future of SSD. It feels good to be here in this room with all of you tonight celebrating the work you have done and the good result of that work. I was told this would be a beautiful night, a wonderful celebration, and a moving tribute to many fabulous people and some pretty terrific dogs, and that certainly proved to be true. When I was growing up and deciding what I wanted to do, I knew one thing. I wanted to work with people. I wanted to be part of something that allowed people, all of us, the opportunity to live our lives to the fullest, to live a good and rich life full of purpose and meaning and value. In order to do that, I discovered, we need something called interdependence more than something called independence. That’s what we have here. That’s what we have in this room. That’s what we have in this program. I grew up in Keystone Human Services and consider myself fortunate that I did. I started as an intern in my last year of college and stayed 33 years….and counting. The mission and vision resonated with me then, and it resonates with me now. I worked in the intellectual disabilities programs and had the great privilege to see many lives changed, including mine, over the course of those years. I’ve witnessed the beauty and richness of life as people challenged themselves to be more and have more and do more and give more. It has been an honor. Before I came to SSD, I was a bit infatuated with the program and excited about what it stood for. I believed what it offered people to have the opportunities to be more fully engaged in their neighborhoods and communities, to live a life more like their family and friends, to engage in valued roles, and generally have a good life. Since I started at SSD, that has been confirmed, and the infatuation and excitement only grew as I got to know Nancy, the staff, the dogs, and some of you sitting in the audience. In a very short time I have come to deeply value my relationship with Nancy and what she has offered me, in sharing her knowledge and her faith in me to carry on. It has humbled me and touched me and grown me. My words truly fail in describing the gift of that. None of us would be celebrating what we are tonight if it were not for her….and her son wanting a dog all those years ago. She established the foundation and reputation that will carry us forward. And she promised me she’s only a phone call away. The staff. I have been energized by this impressive group of people and how they’ve welcomed me and what they’ve already taught me. They are very good at what they do and it gives me great comfort knowing they are there. Everyone has communicated to me their love for this program and their desire to take it as far as it can go. They clearly understand, and acknowledge that it can go nowhere without all of you. That brings me to the dedication of the volunteers. Nowhere have I seen what I’ve seen here. It is truly unprecedented and I sincerely stand in awe. You are out there giving and giving and giving. And you’re so good at what you do and an incredible representation of SSD. I can’t wait to meet all of you and to learn from you. The dogs. They’re beautiful and fun and hardworking and it sure makes life a little better going to work knowing they’re around. And clients, the person side of the team. Resilient and strong and diligent—listening and learning and making it work. You are why we do what we do and we’re honored to be a little part of your life story. The future definitely looks very good. The number of litters, and dogs, is growing and the collaboration through Assistance Dogs International and the North America Breeding Cooperative is strong. We have impressive staff, proficient volunteers, amazing clients, wonderful hardworking dogs, and a new property that will allow us to grow and to showcase this remarkable program. Interestingly, all those years ago when I was growing up, whenever I took those vocational aptitude tests in school, they always suggested I go into animal husbandry and agriculture. Every time. True story. So somehow it does seem full circle, and right, that I get to be exactly where I am right now. I know it’s a good match for me. I hope it proves to be a good match for SSD. Thank you all for being so gracious to me. Thank you for your dedication and perseverance, for being the heart and soul of what we’re all about. I look forward to navigating this next phase of life, and SSD, with all of you.